Being mindful of your expenses, especially fixed expenses that may follow you around for decades, is vitally important. Here are three things you can do to cut down unnecessary monthly expenses and free up cash flow for things that are more important to you—whether that means going on adventures, saving for your kids’ education, or simply having more time and money to pursue your interests. The easiest way to start is by looking at the monthly fees you pay for various subscriptions and services. These “little” expenses can add up quickly. I first noticed this years ago when a sales person was trying to get me to upgrade my cable package for “only 20 dollars per month.” I had a moment where I thought about all the other 20-dollar-per-month things I had already signed up for and thought to myself, “I’m being 20-dollar-per-month’d to death!” I said no, and then went through my bills and got rid of some subscriptions and services I no longer used. It felt great, and I saw the difference in my cash flow immediately. 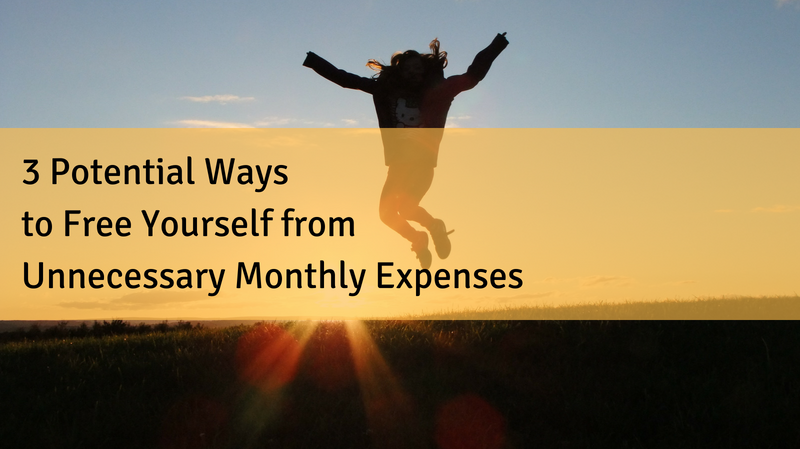 Next, I looked at other unnecessary monthly expenses I had off and on over the years. Payments for carpeting, furniture, and bigger things like appliances. A client of mine shared with me the approach he and his wife took when they first got started. They would either pay cash or only have one thing at a time they were paying for. For example, if they had to buy a refrigerator on credit, then they would work to pay that off before adding anything else to the monthly budget. I took this advice when I moved into my current home after my divorce. I wanted to be very mindful of my expenses, and I wanted to find things that I really appreciated. In some instances, like with my dresser, I didn’t buy one for well over a year because I didn’t want to buy just anything and waste money. In other cases, as I mentioned in a previous post, I made things myself, like my dining table and bed. This is a big one. Housing related costs can be a huge drain on a budget. Obviously, you need place to live. But many people are continually upgrading their homes as their income rises in a way that forever traps them with big overhead expenses. In addition, a bigger home in a more expensive zip code comes with higher taxes and more rooms to decorate, clean, maintain, heat, and cool. If it has been your lifelong dream to have a certain home and owning and maintaining that home truly gives you a sense of joy and satisfaction, then you are doing it right. On the other hand, if you have other dreams that keep smoldering in your heart—like travel goals, education goals, goals for you kids or grandkids, goals for contributing to organizations or causes you care deeply about—then you may want to really look at that choice. Mindful spending requires some discipline, but it’s extremely rewarding. As you begin this process of reducing unnecessary monthly expenses, keep in mind that you are going against what everything in our society is telling you to do. Marketers are constantly shouting that more is better. Bigger is better. And adult peer pressure reinforces that. It takes strength and independence to step away from societal pressure to buy more, spend more, consume more. But it is so, so worth it. Please let me know if you’d like to brainstorm your own budget and look for ways to be freer of financial obligations. Contact me online or email Carlo@IntegralWealth.net.